Open your soul at this unique event. 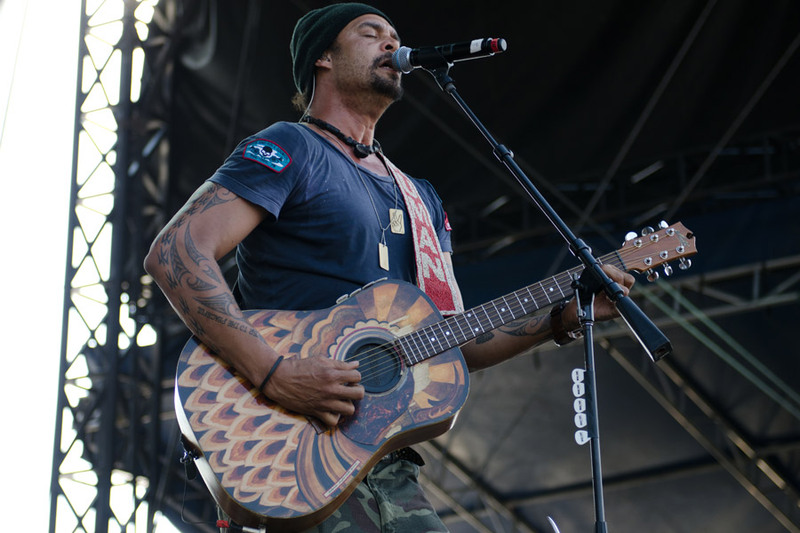 Michael Franti has been practicing yoga for 13 years and making music for much longer; recently he figured out how to combine these two passions in a unique way. His Soulshine tour brings audiences together with an hour long yoga class accompanied by a relaxing acoustic set, followed by Michael Franti and Spearhead’s energetic reggae-infused folk rock along with performances by SOJA, Brett Dennen, Trevor Hall, and Sonna Rele. Driving through the Ozark Mountains between tour stops, Franti took some time to chat with me about why yoga and music aren’t so different, his one-year experience living in Edmonton, and his Do It For the Love Foundation. Franti made it a habit to practice yoga before his shows and began inviting people to come early and join him. It was five to 10 people at first, but then he did a pre-show acoustic set and yoga class before his show in Red Rock, Colorado, and 2,000 people came out. “We thought why not do this across the country?” With some of the best yoga teachers and a few other great bands to play alongside Franti’s Spearhead, the show is the best of both worlds. Practicing yoga before a concert brings the crowd together and creates a different audience dynamic. “I really love the idea of one mind,” said Franti, explaining that the crowd is united at the end of the yoga session. “Everyone is jumping together and dancing together by the end of the yoga class. It’s great to see that take place in yoga — most of the time it’s an inward practice, but at the shows it always ends up with everyone dancing,” he said. Franti is looking forward to the first of two Canadian stops on this tour (the other being Toronto). “Vancouver was the first place I ever did a concert outside of America,” said Franti, so the city will always have special meaning for him. Franti’s other Canadian connection is his girlfriend, Sara Lua, who is an emergency room nurse from Saskatoon. Looking to combine their two careers of healthcare and music, they created a foundation called Do It For the Love, which provides concert tickets to people with life threatening illnesses. The couple was inspired when they met one particular couple, Steve and his wife Hope. Franti said that when Steve found out that he was dying from ALS, he said to Hope “I would understand if you leave, but if you don’t, will you marry me?” Hope wrote to Franti and said that Steve’s last wish was to see his show. “We were so inspired by their love,” said Franti. There are many artists participating in their initiative including Kings of Leon, Train, Santana, and Third Eye Blind. Soulshine will be at the PNE Amphitheatre on June 26. For more information, visit soulshine.com. Photo courtesy of Flickr: Mark Runyon concerttour.org.